Last year I wrote patterns for Christmas elves, but they are quite detailed and take a bit of time to make. And since I know December is the busiest time for all crafters, I thought this year I would make a little elf doll that is smaller and simpler - perfect as a last minute present or if you need to work up a whole bunch. They are not complicated to crochet, but do include some small details, which can be a bit fiddly to make. But if you have some patience and enjoy working on small details, it's right up your alley. Happy crocheting! 17 cm (6 2/3") tall from head to toe, 24 cm (9 1/2") including the hat, with DK weight cotton and bamboo blend and a 2,50 mm crochet hook (US size 2/C). Tip! 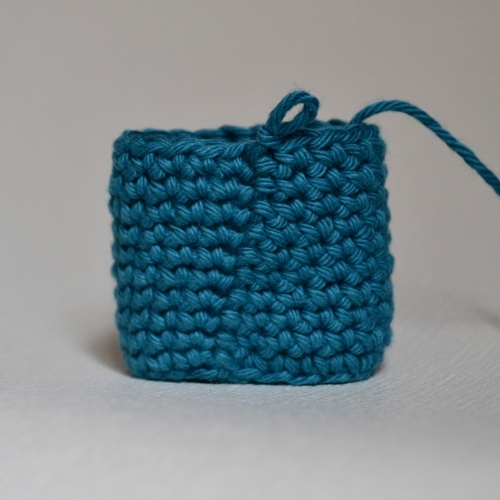 You can use the same pattern to make larger or smaller toys by using finer or bulkier yarn. Pick a crochet hook at least a size smaller than suggested on the yarn label and crochet tightly enough to achieve a tight gauge that will not allow the stuffing to show through the fabric. You may also need to adjust the size of the safety eyes. • Yarn. I used DK weight cotton and bamboo blend, 50g =100m (50g =109yd) / 8 ply / 11 wpi / 3: light. You will need about 10 g of beige, 22 g of red and 2-3 g of white yarn. • 2,50 - 3,50 mm crochet hook (US hook size 2/C - 4/E) or according to the yarn. • 6 mm safety eyes or buttons, beads, felt etc. inc3 = double increase – crochet three single crochet stitches in the same stitch. Attach safety eyes between rows 11 and 12, leaving 7 stitches (count 6 holes) between them. Cut the yarn, leaving a long yarn tail for sewing, and fasten off. Finish stuffing the head. Start stuffing the body. Keep adding a bit of fiberfill after every few rounds, stuffing the body firmly. Cut the yarn, leaving a long yarn tail for sewing, and fasten off. Finish stuffing the body. Turn the body so the end of the round is at the center of the back and sew the head to the body. Add a bit more stuffing before closing the seam. Embroider a little snowflake to the front of the body. Single crochet stitches are square so you could also do a little cross stitch pattern, if you want. 13: sc 3, flatten and sc through both layers. Cut the yarn, leaving a long yarn tail for sewing, and fasten off. Sew the arms to the sides of the body one row below the head. Crochet round 3 in back loops only! Stuff the boots firmly. Keep adding a bit of fiberfill after every few rounds, stuffing the legs lightly. Cut the yarn, leaving a long yarn tail for sewing, and fasten off. Finish stuffing the legs. Sew the legs to the body just above round 3 and a bit more to the front of the body. Cut a piece of yarn for the shoelace. Embroider a few cross stitches. Tie the yarn ends in a bow. Make knots in the yarn ends to keep them from fraying and cut off the extra yarn. Before you continue crocheting the hat, try it on. If it looks like it's going to be too big, take a look here. Make a little yarn pom-pom and sew it to the tip of the hat. Sew the hat to the head with back stitch. And done! Weave in all yarn tails or fasten them with a knot and hide inside the pieces. I would love to see how your elves turn out. Post a photo to my Facebook page or leave a comment below. Copyright © 2015 TÜ Spire. All rights reserved. Please do not post this pattern to your website or blog, instead post a link to http://engsidrun.spire.ee/blogs/blog1.php/free-pattern-small-christmas-elf. You MAY use this pattern as a teaching aid in any free class or e-course, or as part of a free crochet pattern, provided you credit me as the designer (Kristi Tullus, http://sidrun.spire.ee). Feel free to sell items made with this pattern. I would appreciate a credit and a link to my blog (Kristi Tullus, http://sidrun.spire.ee). Have a Very Merry Christmas and a Prosperous New Year. Looking forward to what you come up with for patterns in 2016! Adorable Elves! Thank you so much for sharing them with us. Happy Holidays! I understand crocheting in the back loops, but what does “crochet round 3″ mean? I believe it to mean that on the 3rd row you would crochet in the back row for this row only. Hope this helps. It defines the foot more. It is a fun, fast pattern. Yes, that means you crochet in the back loops only on the next round (or row), 3: sc in each stitch =  and then continue in both loops as usual. Thanks for making this pattern so easy (even though I’m pretty good at crocheting) I needed a last minute gift for my great grandmother and this worked out perfectly. Your elves are totally adorable… I can hardly wait for Christmas again! Thank you for sharing your pattern! I love your Christmas elves! 1. With the head opening, it has 6 stitches and the body opening has 12 stitches - your link to sew the head and body together ( 2 open pieces together) mentions that both pieces should have the same number of stitches but these two pieces don’t ?? I ended up taking off the last round of stitches on the head so they had the same. I plan to make another one so wanted to check it with you before starting. 2. With sewing the open leg to the closed body did you use the whipstitch method or the blanket stitch please? It is hard to tell in the photo and they kind of look like they have been attached flat like the arms. I am new to amigurumi and still learning the techniques. I’m so sorry, there was a mistake in the head pattern, it should end with round 17. The legs are not attached flat, the tops are actually round. I used the mattress or blanket stitch, I think it looks nicer, but both will work. Thank you so much for your reply Kristi, I noticed you have amended the head pattern and I meant mattress stitch - silly me, I don’t why I typed blanket stitch lol. I’ll give it a try. Como puedo cambiar al español las instrucciones? this is the first little people pattern I want to try. Thank you for the free pattern. A few of you said your elves’ hats turned out too big? Here’s how to fix it. How the hat fits will depend on how firmly you stuffed the head. I like to stuff my amigurumi quite firmly and the hat fit nice and snugly. So, the simplest fix is just to add a bit more stuffing to the head. But if the hat is still too big or you don’t want to do it, you’ll need to modify the pattern a little. 1) Finish the first 16 rounds and try on the hat. If it looks like it’s going to be too big, frog the 16th round and do fewer increases, dividing them evenly around the hat. For example, if it looks like you have 4 stitches too many, you will need to do 5 increases instead of 9 as the pattern says. 2) Then finish rounds 17-21 following the pattern, you’ll just have fewer stitches than the pattern says. You can skip a round or two, if it looks like the hat will be too long. 3) And then on the last round, instead of doing … sc 33 …, you’ll have to do fewer stitches there as well. Thank you so much for this beautiful pattern,I loved it,made it and turned out so perct,no problem at all with anything.just perfect and lovely,so cute and beautiful. These look lovely, and the tutorial is great. I’m looking forward to do a couple of these for my Granddaughter (aged 18 months). I love making this pattern. My only problem is that I never seem to get the shoe laces right. I’m so glad you like the pattern. Happy holidays! Round 2 includes double increases - inc3 - where you crochet three single crochet stitches in one stitch. So, crochet one sc in first stitch (sc), then three sc-s in each of the next two stitches (in3 x 2), repeat once more from the beginning: one sc in next stitch (sc), then three sc-s in each of the next two stitches (in3 x 2). And now you should have 14 stitches - 1 + 3 x 2 + 1 + 3 x 2 = 14. Hello, i can’t for the life of me get the shoe laces threaded right, can you please send me a little diagram to my email of how to do it. Thank you so much. love your little elf. I will put together a little tutorial on Saturday. Hi! I love this pattern. Just made an elf and will post it on my blog today. Thank you for this pattern! Hi, I love it. It’s very well made pattern… Thank you very much. Greetings from the Czech Republic!